Participating artists receive 2 Glow Tickets and 50% of sale price. Eco-art can include: lanterns, home furnishings and house-wares, photography, sculpture, paintings, or mixed media pieces. However, it must incorporate at least 1 of the "4 R's" and at least 1 other item listed above. Auction proceeds are split 50/50 between Groundwork Lawrence and the artist. All submissions must include the Eco-Art Registration Form and include a write-up (see form). A minimum sale price for your submission may be set. Items submitted in the past include: artwork made from shredded catalogues, lamps made from "rescued roadside treasures," paintings on used/discarded furniture, and lanterns made from reclaimed wood. 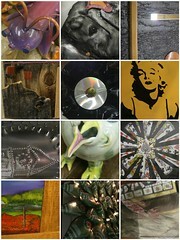 For examples of previous eco-art check out our Flickr Glow collection. We encourage you to use your imagination to help promote Groundwork Lawrence's environmental mission! How much should I expect my piece to sell for? Items have sold for between $10 and $300. We have included items with a minimum sale price up to $5,000. We encourage pieces with minimum sale prices of $20 - $500. Not able to submit an Eco-Art piece this year? You can buy your Glow tickets online now. Thank you for your support!